An unknown representative of Garden State Equality, New Jersey’s largest gay rights organization, who showed up uninvited and took the podium at the conclusion of Monday’s Jerry Sandusky Victimization Act Press Conference, was visibly uncomfortable as he answered questions from the press. The representative, who failed to identify himself, stammered back and forth, hands in his pockets, looking at the ground with a mischievous smile as if he was just caught with his hands in the cookie jar. This was the scene at Monday’s press conference at the State Assembly House in Trenton, New Jersey. Watch the video by clicking here. After a couple of minutes of more lies, in which he claimed that six other “camps” existed in Ohio with similar names as “True Directions,” the fictitious camp that Brielle Goldani said she was tortured in 1997 that only exists in a 1999 movie starring drag queen Ru Paul, I had to challenge. Second, the American Psychiatric Association has never said that Sexual Orientation Change Effort (SOCE) Therapy is an “abusive practice,” and further, Stevenson claims that parents who send their homosexual-oriented children for therapy is akin to child abuse and that these children do not have any rights or consent. In fact, I have gone on the record and all of the colleagues I know who work with lesbian, gay, bisexual, or transgender (LGBT) children do not work on helping them change homosexual feelings unless it is their choice. I am very careful to use advanced informed consent with these parents and children, and often counsel families together for many sessions to ensure that the child is not in therapy against their will. That Stevenson says this is “harmful” and “abusive” is categorically false, and he is misleading the public, which is why he has not provided me the names of these so-called “conversion therapy torture camps” or any citations to back up his claims. You can watch more the questions and answers from Monday’s Jerry Sandusky Victimization Act Press Conference by clicking here. Watch my entire statement to the press on News 12 New Jersey by clicking here (note: some may not be able to view this webpage due to limited access, but you can watch our footage by clicking here. 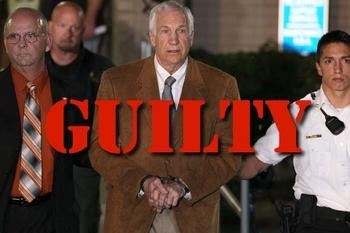 To watch the entire Jerry Sandusky Victimization Act Press Conference (nine segments) click here. This entry was posted in Uncategorized on 2013-05-22 by VoV Contributor.